Fast cut to the link and the first thing seen is the standard chubbish white guys in suits. Minor empirical proof the US began rewarding the useless and nasty decades ago. 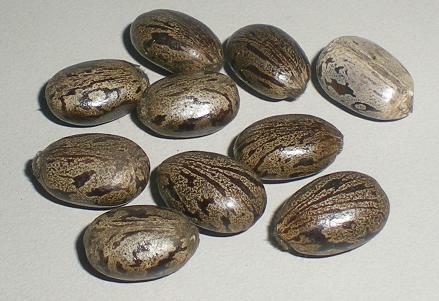 Castor beans do not immediately leap to mind when one considers the state’s most serious problems. And yet bills outlawing the production and transportation of castor beans were among the first filed in anticipation of next year’s legislative session. Castor beans, being 50 percent or more oil, are the among the most promising biofuel crops. But state Sen. Mike Schulz, R-Altus, and Rep. Dale DeWitt, R-Braman, did not have terrorism or espionage in mind when they filed their castor bean bills this fall. They were concerned about a more direct threat – inadvertent contamination of the food supply. Although castor plants are fairly common as ornamentals, their commercial production is virtually unknown in Oklahoma. With growing interest in them for biofuels, however, wheat growers and other crop producers became concerned about a burst of speculative cultivation spreading castor and ricin residue into fields, planting and harvesting equipment, storage bins and trucks and railroad cars used for transporting grain. This is intellectual failure on so many levels it is difficult to know where to begin in explaining the stupidity of it. At some time in the nation’s past — a few decades back — castor was a crop in the US. I have written about this before. None of it sticks. Journalists, politicians, and American alleged terror experts pay no attention to historical precedent or fact. If there are agricultural history and science books in libraries or old newspaper articles and stories to be consulted, they are all discounted and discarded for the apparent reason that people are now too lazy and crippled to be bothered to read them. As an agricultural resource castor posed no real problem. It does not in those places around the world where it still is a crop. And castor mills in the United States were not poison dumps. People were not felled by wandering castor seeds in their morning cereal. Castrol, a famous name in lubricant manufacturing and motorcycle racing, was not known for directly or indirectly killing anyone. It is no longer a surprise to find that people around the world find Americans to be dangerously incompetent. Ignorance and the reward of it are now commonly seen at malevolent levels in this country. Over the course of a decade, from 1959 until 1970, Plainview was considered the hub of domestic castor bean production with the local office of Baker Castor Oil ultimately contracting for 70,000 acres of production annually. However, the crop’s success ultimately worked against it with practically no significant domestic production recorded after 1972. Since that time, the United States has been forced to turn to producers in India and Brazil to supply the majority of its needs. Plainview Mayor John C. Anderson has a unique perspective on the local castor industry, having served as general manager of Baker Castor Oil’s local operations from August 1959 until December 1970. The oil derived from castor beans is used in a vast array of products, ranging from paints, varnishes and lacquers to lipstick, hair tonic and shampoo. Since it does not become stiff with cold nor unduly thin with heat, castor oil is an important component in plastics, soaps, waxes, hydraulic fluids and ink. It also is used to make special lubricants for jet engines and racing cars, and during World War I, World War II and the Korean War it was stockpiled by the federal government as a strategic material. Bayonne, N.J.-based Baker Castor Oil Company already was a major importer and processor when it embarked on a plant breeding program in the late 1950s centered in Plainview in cooperation with the U.S. Department of Agriculture. Not only were there concerns about production and price volatility, the imported oil had a tendency to turn rancid during transport, Anderson said. A domestic source would reduce transportation costs while substantially improving quality. And, Plainview was a logical choice since the harvested crop could be shipped to crushing facilities on both East and West Coasts. Amazing. Harvested castor seeds were crushed daily. And nobody died! Obviously, in Oklahoma you can be … I don’t even wanna get into it. I seem to recall that castor oil was an important lubricant in WWI-era rotary-engine aircraft (the cylinder block spun around a stationary shaft). Since there’s only one way to get fuel and lubricant to the spinning cylinders (i.e. through the center of that hollow stationary shaft), a lubricant that was not thinned by gasoline was needed–which is where castor oil came in. The exhaust from those engines contained a lot of castor oil, which fogged goggles, windshields and made a gummy mess of everything (one of the uses of the long aviator’s scarf was to wipe the oil fog from his goggles). I’d bet it also happened with the race car and motorcycle drivers, too. Anything that would get a lot of it into your open mouth over the course of a couple hours of competition. Part of this news piece — a bit I didn’t mention — is the citation of castor being of interest in biofuel production. Castor was subsidized in the US and when those cash incentives were removed in the Seventies production dwindled against overseas cultivation. In Oklahoma there is a good amount of corn subsidy for the production of biofuel ethanol. And it doesn’t make ethanol competitive but it does jack up prices of food and get extra money into the hands of the people cultivating it. Some of this may show a bit of a legislative effort to keep what’s left of the pie in corn subsidies since castor cultivation would also require subsidy. And like corn, it’s a scam. There’s absolutely no way to make any theoretical production of biofuel from castor efficient or cost effective in the US, even propped up by subsidy. Castor has been explored overseas in emerging, low energy requirement countries overseas as a biofuel source, along with jatropha, but it just never catches on. Like jatropha it seems a fad to attract investment money that then goes rancid.